The 2018 Acura MDX Hybrid combines a 3.0-liter V6 gasoline motor and electric drivetrain to offer superb performance and economy levels. It is fitted with a sharp 7-speed dual-clutch transmission and all-wheel drive as standard, handling is particularly impressive and equipment levels are good too. You get standard heated and powered front seats, leather interior as well as a premium 10-speaker audio system with navigation. Safety too is excellent with a whole host of driver aids such as road departure and forward collision warning systems also fitted as standard. The Acura MDX Hybrid is a strong offering in the luxury mid-sized SUV sector and its hybrid drivetrain both enhances economy and performance levels. For 2018 the MDX Hybrid now offers an updated infotainment system. The interior of the MDX Hybrid is well up to the class standards, it features high quality materials and a very well-built cabin with seating for 7 occupants. Some cheap bits of plastic trim seem out of place but most of the controls and switchgear impart a feeling of solidity and quality. The front seats are superbly comfortable and perfect for longer trips, the second row still offers decent head and legroom with similar levels of comfort. The third row is tighter than in most competitors and is best suited for occasional use. Both rear rows are foldable (60/40 for the second row and 50/50 for the third row) to add to the already decent cargo space. The MDX Hybrid is a big departure from the usual uninspiring handling dynamics inherent in most hybrids. It feels sharp and agile through a set of corners and thanks to its standard all-wheel drive setup, has plenty of grip when the road conditions get slippery. Pure electric motoring is possible at city speeds and the transition between the gasoline and electric powerplants is seamless. The ride is firm but offers decent bump absorption over most surfaces, the standard adaptive dampers offer driver selectable settings to soften the ride over rough pavement. 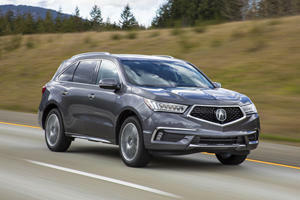 The all-wheel drive system is road-biased without some of the off-road options such as hill descent control that rivals offer, but the raised ride-height should make the MDX more than capable in most casual off-road excursions. The Acura MDX Hybrid is fitted with a 3.0-liter V6 which combined with three electric motors pushes out 321 horsepower and 289 lb-ft of torque. Both higher figures than the gasoline powered version and performance figures are better too. 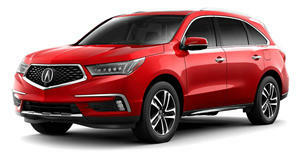 The Hybrid MDX is all-wheel drive only and is available with a 7-speed dual-clutch transmission, it completes the 60mph benchmark sprint in around 6.5-seconds which is very good for the this segment and the pick-up from standstill feels strong thanks to the assistance of the electric motors. Another benefit over the gasoline powered MDX are significantly enhanced fuel economy figures, especially if you spend the majority of your time in stop-start traffic. City driving averages out at 26mpg while highway trips see you get 27mpg. The 3.5-liter gasoline engine offers 18/26 mpg. There are two trim options to choose from in the Hybrid MDX. The Technology trim offers a number of notable items such as power front seats with heating and memory function, leather interior, multi-zone climate control, power adjustable steering wheel and a power liftgate. LED headlights, sunroof and an adaptive suspension are also included as are an updated infotainment system with dual screens, navigation, integrated smartphone capability, Bluetooth, USB ports and a 10-speaker premium audio system. Safety systems include adaptive cruise control, blind spot monitoring, rear-cross traffic alert, forward collision and lane departure warning as well as autonomous braking. The Advance Trim adds Sports seats with enhanced leather trim and ventilation for the front row, heated second row seats, surround camera system and parking sensors and LED fog lights. The Acura MDX is an accomplished mid-sized luxury SUV, a high-quality interior, excellent driving dynamics and strong performance place it near the top of its class. Add the hybrid drivetrain however and the MDX becomes even more compelling, economy and performance levels receive a welcome boost and the all-wheel drivetrain enhances handling even further. It may not be the class leader in all segments but the few flaws it has aren’t enough to take away from the fact that the Acura MDX Hybrid is one of the best sporting hybrid SUVs on the market. Acura has announced pricing details and options for its luxury hybrid SUV flagship.